NES Valkyrie no Bouken: Toki no Kagi Densetsu (JPN) in 06:12.35 by Takanawa. Valkyrie no Bouken: Toki no Kagi Densetsu is an action-adventure game. 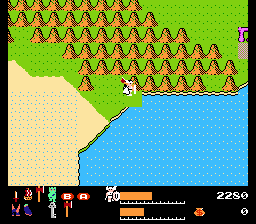 Similar to its many contemporaries, the player roams top-down wilderness areas, fighting enemies and collecting gold and experience points, which will eventually cause the heroine to level up and become stronger. Unique to this game is the star sign system, where the player's initial choice of star sign and blood group for the heroine may affect the changes in her statistics when she levels up. Takanawa chooses Aries as zodiac sign and AB as blood type for his character, the former allowing him to start with 64 HP and the latter for increasing his HP or MP at random. He gets all the items necessary and beats the game in 6 minutes and 12.35 seconds.